The so-called "Statue of Liberty of Los Angeles" is on a one mutant mission to keep L.A. weird. Standing sentinel over the City of Angels is a feathery guardian whose precious yellow bucket is always at the ready whenever visitors look up in search of an oddity. This hero’s name is Chicken Boy. Gift shop offering toe tags and chalk body beach towels tucked into a coroner's office. 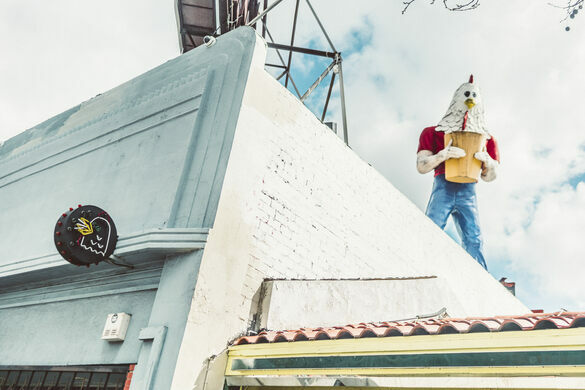 Part man, part chicken, the 22-foot-tall fiberglass figure stands atop the Future Studio Gallery located along a stretch of Route 66. 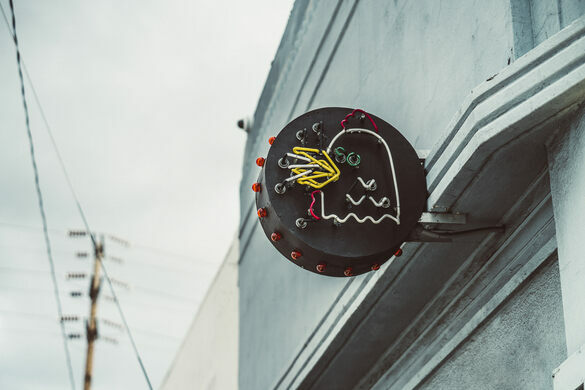 The amalgamated mascot was originally one of the once-ubiquitous Muffler Men, a group of notable customized statues which populated the famed Mother Road, but it was modified to advertise a fried chicken restaurant that shared his name. Once the restaurant closed in 1984, the avian hybrid’s future was uncertain, but thanks to the efforts of local artist Amy Inouye, a woman who had long admired the whimsical chimera, the fiberglass figure was saved from the scrapheap. After much lobbying and an attempt to have the figure entered into a museum, Inouye was finally granted custody, and the homeless Chicken Boy was placed in storage, awaiting a new home. Unfortunately, a suitable place was not found for some two decades. In 2007, Chicken Boy’s long dark tale ended when he was placed in his current location with the help of volunteers and donations. Today, he is still a celebrated piece of L.A. strangeness that is beloved by many. In fact, September 1 has even been declared to be his birthday–just in case anyone wants to throw him a party. A Bicycle Path in the Sky. A cobblestone alley with an interesting past. A pair of large white marble lions guard this stretch of the Mojave Desert, and it is utterly mysterious how they got there. The Midwestern United States' tribute to Michelangelo is a foam statue sprayed with gaudy gold paint.